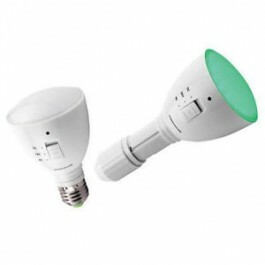 This unique 2-in-1 LED light system can be used either as a flashlight, a standard indoor/outdoor lamp. To use it as a flashlight, just extend the handle and turn it on. To use it as a standard lamp, simply unscrew the end cap and insert it into any household light fixture with the same size standard base. Features a bright green light and long battery life. Lithium battery for flashlight recharges with AC power when placed in a light fixture.